When does this group meet? 1st and 3rd Thursdays from 10-11:30am. View the calendar on the main page. Feel nervous about “just showing up”? If this sounds like you, no fear! 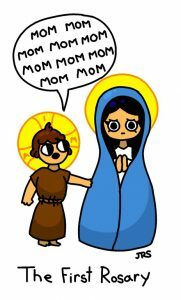 Contact the leaders or check the Facebook page to see when the next “Meet and Greet” after Mass is being held. Note: This group is a combined effort of St. Louis & St. Francis Parishes, who are sharing resources and space. 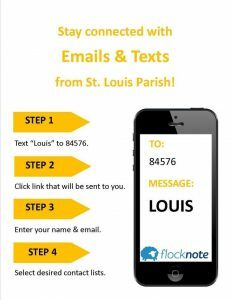 Please see contact information for the volunteer leaders, as well as FlockNote sign up instructions. Saturday Mass: 4:00pm | Sunday Masses: 6:45 a.m. | 8:00 a.m. | 9:30 a.m. (Contemporary) | 11:15 a.m. (Choir) | 12:45 p.m.
Reconciliation: Saturday: 3:00 – 3:55 p.m. and 5:00-5:25 p.m. The weekday 7:00am Mass is cancelled for Monday the 4th. St. Louis School is on a 2 hour delay. The Parish Office will open at 11:00 am. The Clarksville Picnic is this Saturday. Click here for more info. It takes a village, or in our case a parish, to work together to ensure a successful picnic. Click here to see all available picnic volunteer opportunities, choose one and sign up.